Visual processing disorder is a term which is often used among educational and special needs professionals. Depending on who uses the term, it can be quite a broad category, as a quick scan of the internet will show. It may not be an official diagnosis, but it is an acknowledgement that your child is struggling to process what he or she sees, and can give you and the therapist some guidelines for intervention. With this article, I try to help parents understand how a visual processing disorder can affect their child. Click on the quick links to find some answers to your questions on this page. What are the signs that my child is struggling? Is it an vision issue or a visual processing issue? 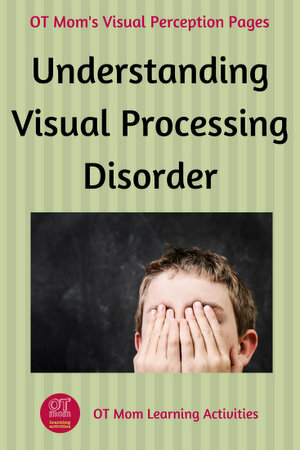 What is the connection between visual processing and SPD (Sensory Processing Disorder)? How does a delay in a specific visual skill affect my child? Are there any resources to help parents? The advice and learning activities on this website are NOT a replacement for evaluation and treatment by an occupational therapist. If you suspect your child has visual perceptual delays, please seek a professional opinion and read my disclaimer before proceeding. These are just a few of the signs that may suggest that your child may be struggling with visual processing. The symptoms depend on the type of delay and can vary greatly from child to child. Either the brain is not making sense of what it sees (ie a visual processing disorder)…or it is not receiving accurate information from the eyes in the first place (a vision issue)! Vision Issue Or Processing Issue? How do we know if the problem lies with the message that the eyes are receiving or with the brain’s processing? We can only know for sure if the child has undergone a complete eye function examination to rule out a visual problem. A behavioral optometrist tests much more than just 20/20 vision – he or she will, (among other things) check whether the eyes are working well together to focus on both stationary and moving objects. If these vital eye functions are poor, your child’s eyes will not be sending accurate information to the brain. If your child is currently not making good progress despite receiving therapy intervention for visual processing disorder please ask your therapist or teacher for a referral to a behavioral optometrist. You could save a lot of time and effort in the long run by getting to the root of the problem sooner. SPD is sensory processing disorder, and as vision is one of the senses, it is worth taking a look at how visual processing can be affected by sensory processing disorder. The descriptions are not comprehensive and I encourage you to chat to an occupational therapist if you feel your child struggles with one or more of these sub-categories of SPD that involve the visual sense. Your child may have visual defensiveness if he/she dislikes and avoids bright lights and being outdoors on a sunny day. This child may also dislike watching moving objects such as merry-go-rounds, or may feel stressed by the unpredictable movements of kids in the playpark. He/she may easily become dizzy or nauseous being in an environment which is visually busy (eg the bustle of a fairground). Your child may be visually under-responsive if he or she is slow to take note of what is seen and therefore slow to respond appropriately. For example, this child may walk in the path of a moving swing, or may not duck out of the way of a falling object, because the brain is under-responsive to the visual information coming from the eyes. Among other things, a child with this difficulty may find it hard to differentiate similar looking letters and words (such as b, d, p, or 2, 5, S). He or she may struggle with depth perception, spatial relationships and with reading other people’s non-verbal body language (eg facial expressions). Read my brief explanations on how a delay in specific visual perceptual skills can affect your child's functioning. A child with poor visual motor skills finds it hard to coordinate hand or foot movements (the motor component) with what is seen (the visual component). This affects gross motor activities such as catching or kicking a ball, eye-hand coordination games, as well as fine motor activities such as threading beads, tracing handwriting patterns, doing buttons and coloring within the lines. Closely related to poor visual-motor skills, visual dyspraxia affects a child’s ability to plan what to do based on what is seen. This child may fill up a cup to overflowing because the brain cannot use the visual information (of the cup getting fuller) to plan the appropriate response (to stop pouring before it reaches the top). This child may struggle to position the body to catch a ball or to reach for an object, often overreaching or coming up short. He or she may also struggle to plan and layout a poster for a project, or to identify what is wrong with a layout (eg a table setting). A sensory-trained occupational therapist who is working on a child who struggles with visual processing disorder will usually include vestibular (movement) activities and activities that work on the core and shoulder muscles (postural activities) as these have an effect on the visual system and can help to improve visual processing skills. There are many areas of visual perception and often teachers and professionals differ in the terms they use to describe various visual perceptual tasks or even to define visual processing disorder. This list is not comprehensive, but should cover the areas most commonly referred to within the school environment, and gives a brief description of what a delay might look like. 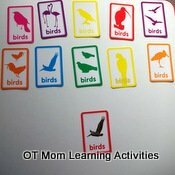 For more information and specific visual perceptual activities to help develop that skill, just click on each heading. The advice and learning activities on this website are NOT a replacement for evaluation and treatment by an occupational therapist. If you suspect your child has visual perceptual delays, please seek a professional opinion and read my disclaimer before proceeding. The ability to recognize and label an object correctly even when it is viewed from a different perspective, or even if the color and size are different. The ability to see subtle differences and to see if something matches up or if it does not belong. Young kids with delays may struggle to: match clothing, socks, or cutlery, especially when the differences are subtle, and may not see the difference between similar objects. They miss out small details in pictures and books. The ability to visually focus on one specific piece of information in a busy background. Kids with delays may struggle to: find information on a busy blackboard and find words in a dictionary. Map skills may be poor. They may also lose their place when reading or copying work. The ability to correctly perceive an object or word, even when it is partly hidden. Kids with delays may struggle to: make sense of smudged words and different fonts. They may find it hard to read messy or cursive writing, and can't make sense of road signs that are partly obscured. The ability to recall the visual details of what you have seen. Kids with delays may struggle to: copy words and sentences quickly as they can only memorize one letter at a time. They may struggle with basic phonics, easily forgetting what the letter for a particular sound looks like. They may struggle to learn sight words. The ability to remember the visual details in the correct sequence. Kids with delays may struggle with: spelling and reading, where the correct sequence of letters must be recalled. When doing multiple digit addition and subtraction, visual sequential memory is essential to aid in the correct copying of the digits from the board or from a book. You can download and print out this free information booklet (89KB) to help parents and caregivers understand how visual perceptual delays can affect a child. If you suspect your child has a visual processing disorder, please do not hesitate to get a professional opinion. Consult an occupational therapist or a behavioral optometrist. 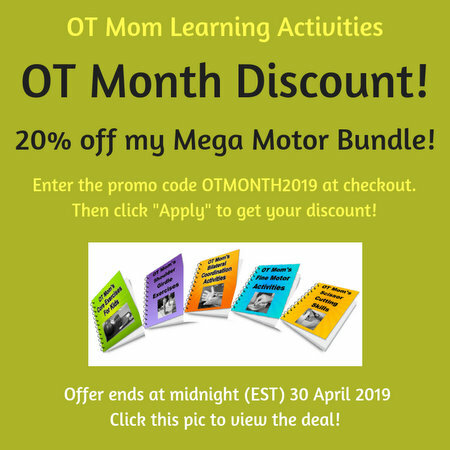 The Out-of-Sync Child by Carol Stock Kranowitz (affiliate link; opens in a new window) is a helpful book for parents who suspect that their child has sensory processing disorder (of which visual processing plays a part).